23” k&R. 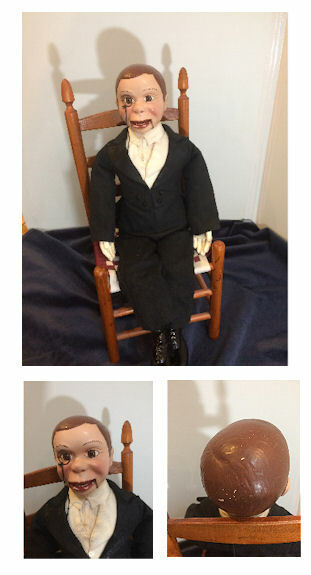 117 Mein Leibling doll. Marked K&R 117 Simon Halbig on back of head with 58 on neck. brown glass eyes. 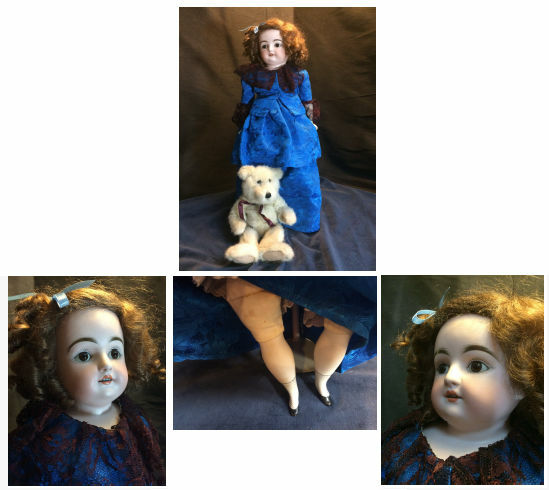 Brown mohair wig, porcelain lower arms, feet, with cloth body. Polyester dark blue dress. Porcelain legs are replacements and are the incorrect size. modern shoes and tights. Dress has one small hole just above hands. 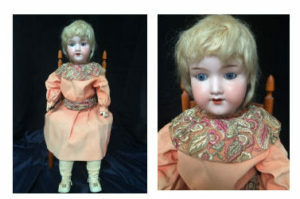 This doll has a composition articulated body that is in very good condition. Does not need restringing, has no missing or broken fingers or toes. 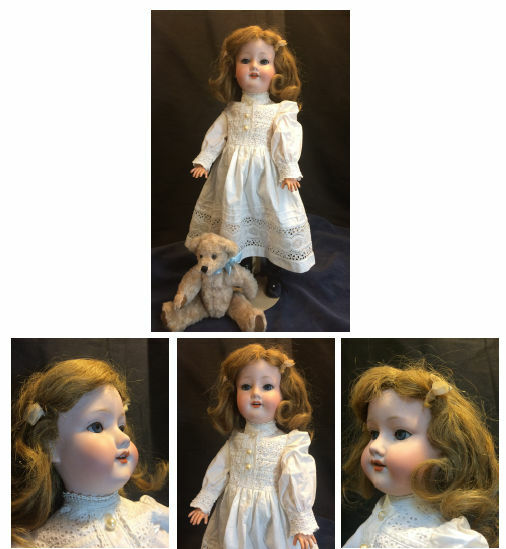 This is a very nice doll for its price and a great doll for your collection. 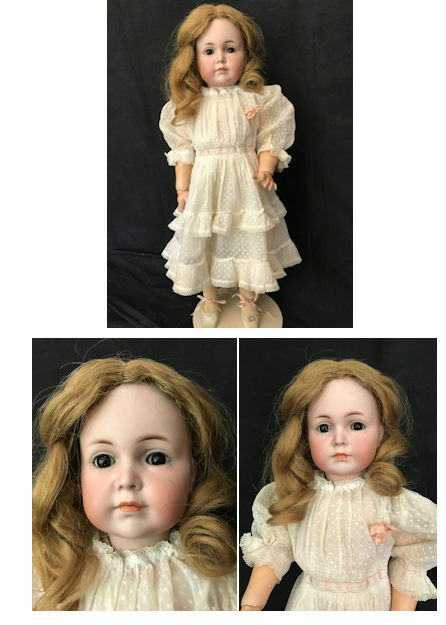 happy with this doll please contact us for our return policy. Does not include bear. 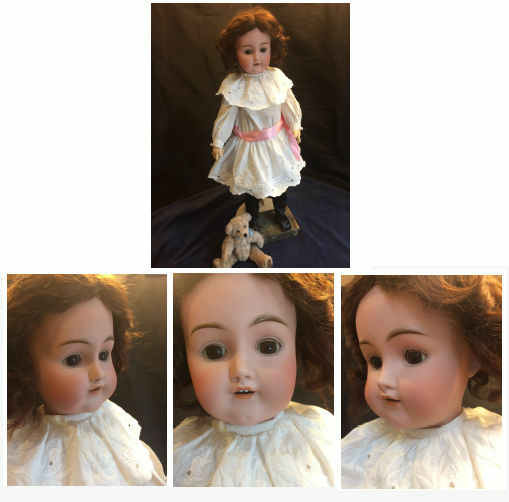 Marked 101–13 ¼ This doll has an open mouth with four teeth and very nice flawless facial features. 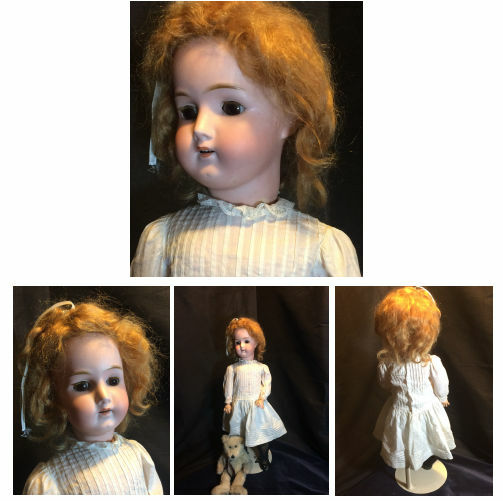 She has big brown rocker eyes, but no upper eye lashes, dark brown mohair wig. 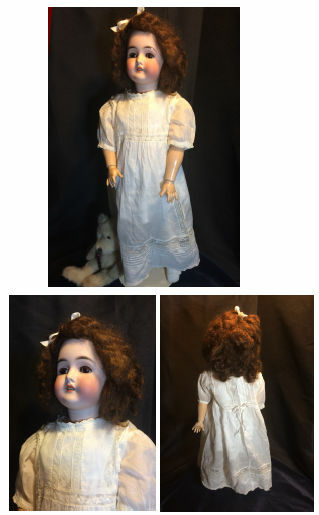 Vintage white dress, slip, bloomers, stockings and shoes. Composition body is an original but has been restored and restrung. 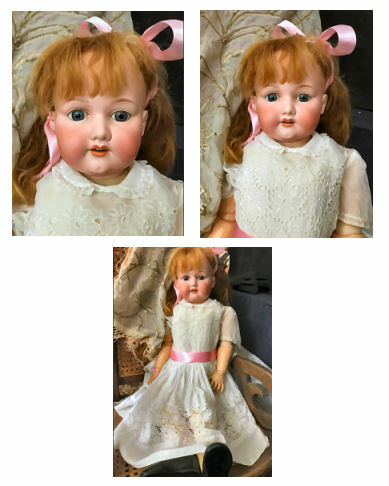 We have honestly described the condition of this beautiful doll. 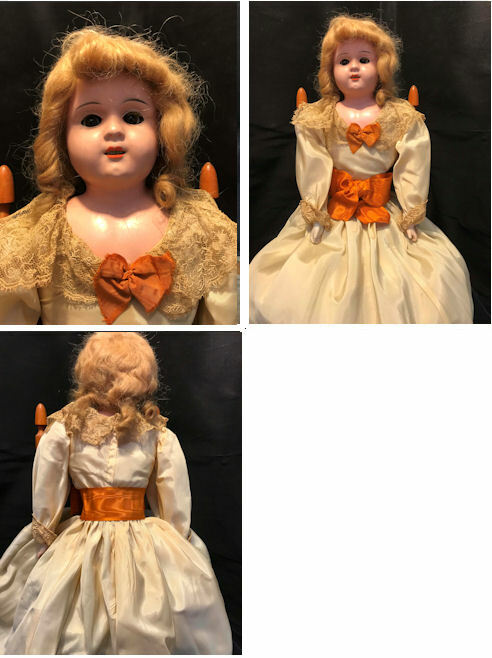 We are not sure of who this doll is but she is just a nice doll. Does not include prop or bear. 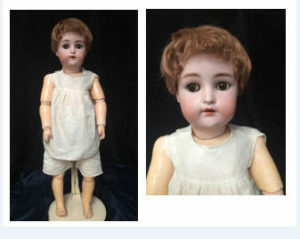 This doll by Armand Marseille is marked Queen Louise 100 Germany. are slightly deteriorated and a few blemishes in pink cheeks. Dark brown mohair wig. Composition body in beautiful condition, no broken fingers or toes. Vintage white dress, slip and under wear with modern white stockings and shoes. Marked Arnand Marseille 390n, Germany A5M. Beautiful complexion with a blonde human hair wig. Blue glass rocker eyes, modern black tights, shoes, bloomers and underwear. White eyelet dress that we purchased in Germany in the 80”s, vintage? It’s a beautiful handmade dress. not operate. Back of head some chipping in hair color as well as his bottom lip.